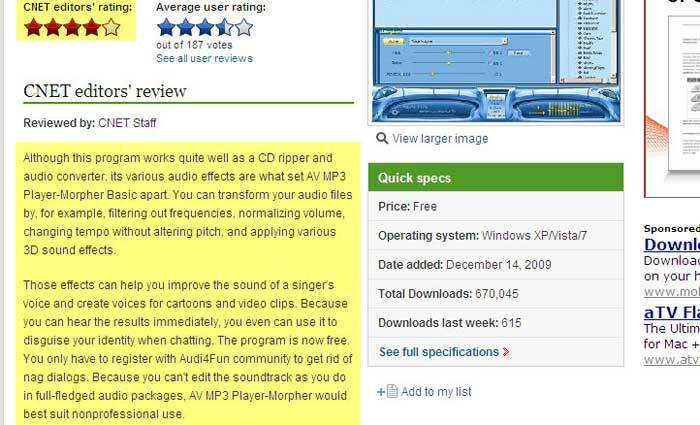 Although this program works quite well as a CD ripper and audio converter,its various audio effects are what set AV MP3 Player-Morpher Basic apart. You can transform your audio files by, for example, filtering out frequencies, normalizing volume, changing tempo without altering pitch, and applying various 3D sound effects. Those effects can help you improve the sound of a singer's voice and create voices for cartoons and video clips. Because you can hear the results immediately, you even can use it to disguise your identity when chatting. The program is now free. You only have to register with Audi4Fun community to get rid of nag dialogs. Because you can't edit the soundtrack as you do in full-fledged audio packages, AV MP3 Player-Morpher would best suit nonprofessional use.